Four and a half billion years ago, a whirling cloud of cosmic dust condensed into the lump of rock we call home. For the first time, astronomers are now watching that same planet-forming process playing out around a distant star. The star in question, LkCa15, sits 450 light years from Earth, at the center of the image above. It’s surrounded by a mess of gas and dust (shown in grey) called a protoplanetary disk. Cosmic dust clouds are a common sight around young stars, but LkCa15’s disk is pretty unusual: something has eaten away at its center. According to a new analysis by astronomers at the University of Arizona, that something is a planet—a planet in the process of forming right now. 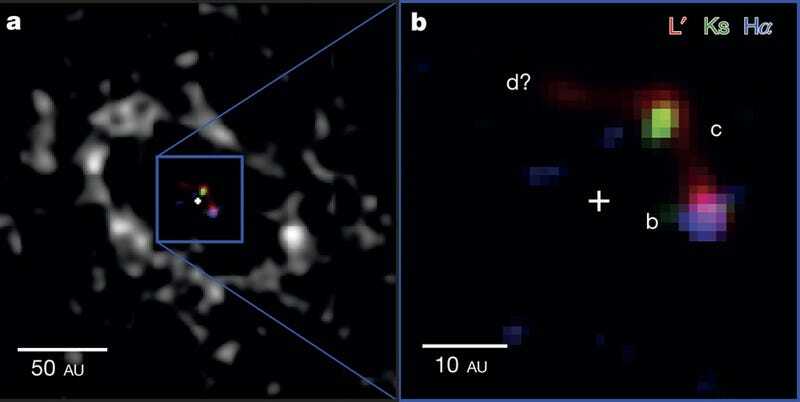 “This is the first time we’ve imaged a planet that is definitely still in the process of forming,” said Peter Tuthill, co-author of a paper describing the find in this week’s Nature. Telescopes are finally becoming powerful enough that astronomers can image objects close to—but much fainter than—neighboring stars. As our instruments continue to improve, we can expect to witness many more planetary birthings. But for now, this is an utterly unique sight, and a testament to just how far astronomy has come. Top Left: Composite image of LkCa 15, with blue showing the Magellan data taken at the H-alpha band, and green and red showing LBT data taken at infrared wavelengths. The greyscale is a previously published image of the disk. Top Right: Zoomed in composite image of LBT and Magellan observations, with several distinct objects marked. Image Credit: University of Arizona.